The Green Hornet is a masked fictional crime fighter, originally created by George W. Trendle for an American radio program in the 1930s.The character has appeared in two Universal serials. In the first 13 episode serial, the city is faced with rising crime and increased racketeering activity. 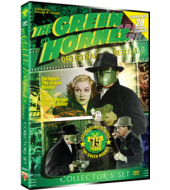 Intrepid newspaper editor, Britt Reid (Gordon Jones) becomes the crime fighter the Green Hornet to take on the bad guys. As far as the police are concerned, the Hornet himself is the criminal. This misunderstanding enables Reid to operate "outside the law" to battle evil and injustice. Working along side the Hornet is the brilliant inventor/sidekick Kato (Keye Luke), the only person who knows the true identity of the Hornet. Watch as our heroes fight an infamous racket and put an end to the menace infecting their city. 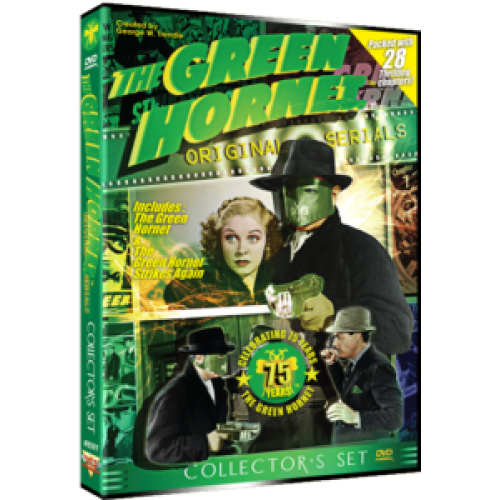 A Universal movie serial based on the The Green Hornet radio series by George W. Trendle is the sequel to the 1940 serial The Green Hornet. With "A thousand ALL-NEW thrills!" this 15 episode serial featuring Britt Reid (Warren Hull) continues the crime fighting saga of the Hornet. While enjoying a vacation in Hawaii, Reid learns that a crime organization has extended its activities into almost every industry of the city. Disguised as the Green Hornet, Reid executes several attacks on the underworld establishment. Each foray brings him closer to the identity of the syndicate mastermind, an arch crook named Grogan.